One of the World’s Best Ayurvedic Wellness Retreat in India. Kairali—The Ayurvedic Healing Village sits on 60 tropical jungle-filled acres laden with hundreds of coconut, teak, and mango trees in southern India’s town of Palakkad. Nestled at the base of the Western Ghats mountain range, a UNESCO World Heritage Site between the states of Kerala and Tamil Nadu, the holistic health retreat takes a refreshingly modern approach to the authentic practices of ancient India. Retreat guests consult with Kairali’s staff of doctors before selecting Ayurvedic treatments and specialty wellness, beauty, and fitness programs and packages tailored to different aims, from stress management and detoxification to health ailments and yoga. A strict vegetarian cuisine capitalizes on the cleansing and healing therapies. As well, 30 villas reflect the feng shui-type design principles of vastu shastra to encourage healing energy. Every detail of the 5,120-square-foot spa at Kairali lends itself to the uplifting yet soothing natural surroundings. Design elements center around a 20-foot waterfall and flowing stream, complemented by an open-air space that leads out onto an expansive lawn. Spa treatments are customized to each guest’s individual body type and integrate Kairali’s Ayurvedic-based product range manufactured in house; a majority of ingredients found in the Ayurvedic preparations are sourced from the retreat’s organic herb garden. Rituals include the Royal Makeover, which begins with a simple prayer, followed by padaprakshalanam (traditional foot massage); Siro-abhyangam (traditional head massage using herbal oils); Abhyangam massage; and Twak Shodhanam scrub. A mukha-abhyangam (face massage), nethradhara (eye treatment), and steam bath enhance the experience. Panchakarma, yoga, and meditation workshops are offered, and astrology, numerology, and palmistry sessions are available upon request. Mornings invigorate guests with yoga class, while evenings wind down with meditation. Guests can also stay active exercising in the 800-square-foot, cardio-equipped fitness center, playing on the tennis court, testing their culinary skills in cooking class, or swimming laps in the outdoor pool. Dance and martial arts performances are enjoyed in the alfresco amphitheater. 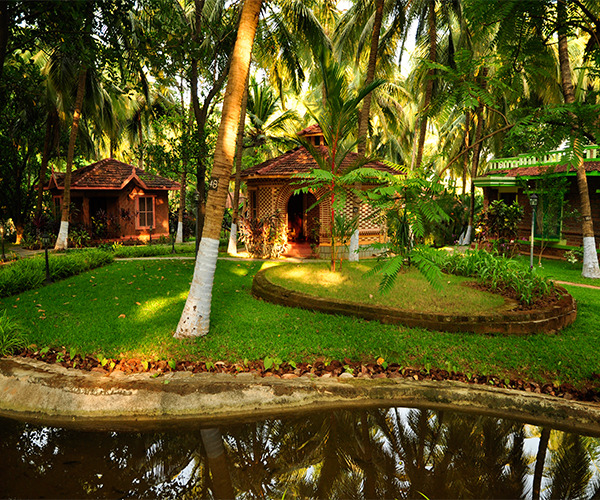 Additionally, off-site exploration is encouraged: The Kairali Ayurvedic Healing Village’s location at Palakkad allows for easy access to Kerala, as well as the region’s tropical forests, pristine hills, rugged dams, rushing rivers, and wildlife sanctuaries. Local landmarks include Silent Valley National Park, the ancient Tipu Fort, dating back to 1766 AD, and the historic Hanuman Temples. Thirty guest villas immerse travelers in the beauty of the tropical forest-laden mountains and flowing waters that envelop the Ayurvedic healing village, whilst offering contemporary amenities such as air conditioning and private baths and showers. Each room has a valampuri conch shell, said to release positive vibrations; other elements like red oxide, a naturally cooling agent placed in the flooring, provide a unique touch. Lodging options include the intricately decorated royal villas and elegant Maharaja suites, the latter of which features king-size beds and private lawns neighboring a swimming pool or river. Two on-property restaurants, White Lily & Ottopura, cater to Kairali’s strict commitment to a vegetarian-only diet. Alcohol is not served, and smoking is not permitted on site. Meals are specific to each individual’s needs, with dishes that emphasize locally grown organic ingredients.